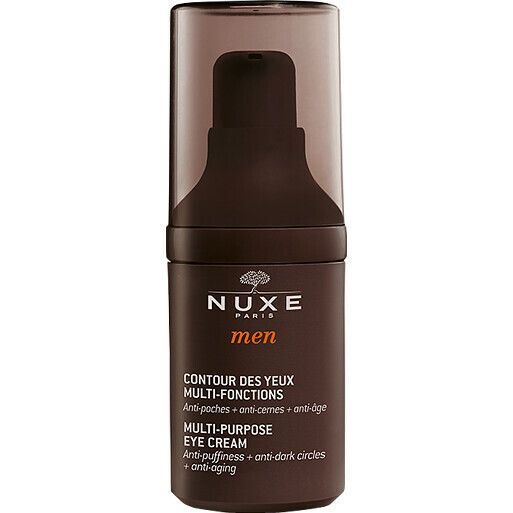 Smooth and revive the eye area each morning with the Nuxe Men Multi-Purpose Eye Cream. The multi-purpose eye cream works in three ways, targeting puffiness, dark circles and ageing in one step. Energising plant caffeine reduces puffiness and fades dark circles, while natural hyaluronic acid smoothes the eye contour. Anti-ageing araucaria extract is paired with Vitamin E to relieve stressed skin, sandalwood and phellodendron to reduce irritation, and oak and hornbeam extracts to repair the skin’s barrier function for a soft and soothed under eye area. Tap and smooth the Nuxe Multi-Purpose Eye Cream onto the eye contour each morning, and follow with the Moisturising Multi-Purpose Gel for a fresh complexion.